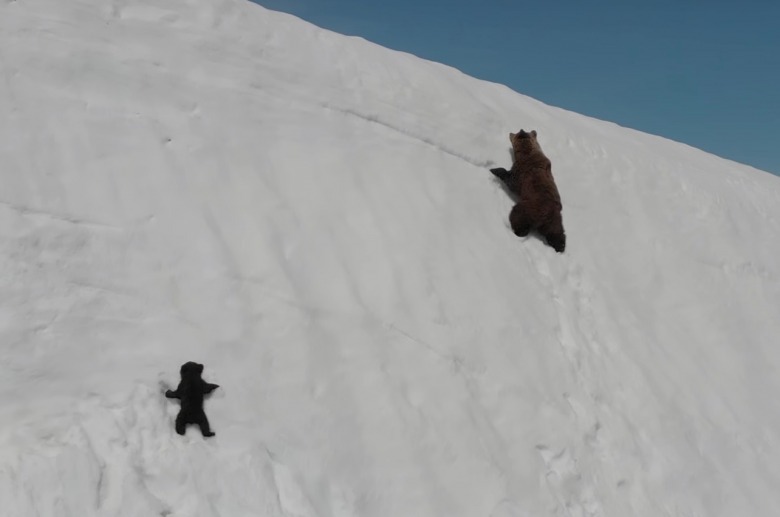 By now, you’ve surely seen the viral (perhaps in the pathological sense) drone footage of a tiny brown bear cub sliding down a snowy mountainside– a literal cliffhanger – and then heroically scaling its way back up the sheer face to its very relieved mother. The video – posted at Bozeman-based ViralHog– has been viewed nearly 30 million times in just five days across multiple social media sites. ViralHog captionedthe video with a feel-good message about the cub’s grit in the face of a challenge. The cub’s tenacity is indeed inspiring, and it’s uplifting to see the cub top the snowy escarpment, vanquishing adversity. What if, though, the person capturing this footage had carelessly created most of the adversity in this vignette? And what does the popularity of this video mean for the future of wildlife photography and filmmaking? What is the responsibility of the shooter trying to get a famous shot? The footage apparently comes from an unknown drone operator in the Russian Far East, captured in June 2018. The mother and cub are brown bears, members of the species Ursus arctos–the same species as our Rocky Mountain grizzlies, albeit separated by some 30,000 years and 4,000 miles. U. arctosspans a good portion of the Northern Hemisphere, from Spain to Wyoming). The video opens with mother bear and cub venturing out onto the snowy slope. After a short traverse, the pair head straight up the slope, slushy spring snow sloughing away under them. The mother bear, with mass, strength, and claw length on her side, quickly climbs the slope, glancing several times over at her youngster as it struggles upward. The cub slides down the slope, self-arrests, then climbs again. It loses traction and slides down a second time. On its third trip up, the cub shifts over into the tracks its mother left in the slope, and makes halting progress toward the ridgetop. Here’s where things go from seemingly heartwarming to infuriating: the drone operator, possibly hoping to capture the glorious moment when the cub conquers the treacherous slope, zooms in close to the bears. Drones are noisy, Roberts reminds us, and a quick acceleration makes them buzz even louder. “It’s an aggressive sound,” says Roberts, who has used a drone to herd cattle while working on conservation ranching films. The drone clearly gets mother bear’s attention as it heads their way. Remember, these bears are genetically and behaviorally very similar to our grizzlies, and they tend to respond to perceived threats with aggression. As the cub struggles up the final inches, its protective mother makes an aggressive feint in the direction of the drone. Looking directly at the camera, she does what bear folks call a “ground swat,” probably trying to scare the intruding machine away. Her sudden burst appears to startle the cub, and may have dislodged some of the snow the cub was climbing. For a fourth time, the cub clambers back up the slope. This time, the drone backs off to a relatively safer distance. The family is reunited, and they lope off to parts unknown. Of the millions of people who have watched this drama, a sizeable number are outraged at the obvious interference by the drone (even if unintentional). On-line commenters and wildlife biologistshave roundly condemned the piece. Yet, by paying people for footage, and then blasting those images out to tens of millions of viewers, ViralHog and similar sites are in fact rewarding filmmakers who might even be ethically dubious with money and fame. They are creating demand for videos, the more novel and astonishing, the better. How is this any different from celebrity-stalking paparazzi and the tabloids that pay for harassing photographs? “By rewarding this kind of unethical behavior, the internet is simply encouraging more of it,” says Roberts. However, it gets at another issue. Civilian drones are a powerful and relatively new technology. They have many legitimate uses, including Search and Rescue, wildland fire reconnaissance(in the hands of official fire personnel only), and in many wildlife research situations. “As the technology gets better and cheaper, though, more people are going to be out there pushing the limits of what’s safe and ethical,” warns Roberts. Many public lands have banned drones, including Yellowstone where in 2014 a judge fined a Dutch tourist $3,000 after he accidentally crashed his drone into Grand Prismatic Spring, one of the most spectacular and delicate geothermal features in America’s first national park. Earlier a German tourist was fined $1600 after crashing a drone into Yellowstone Lake. 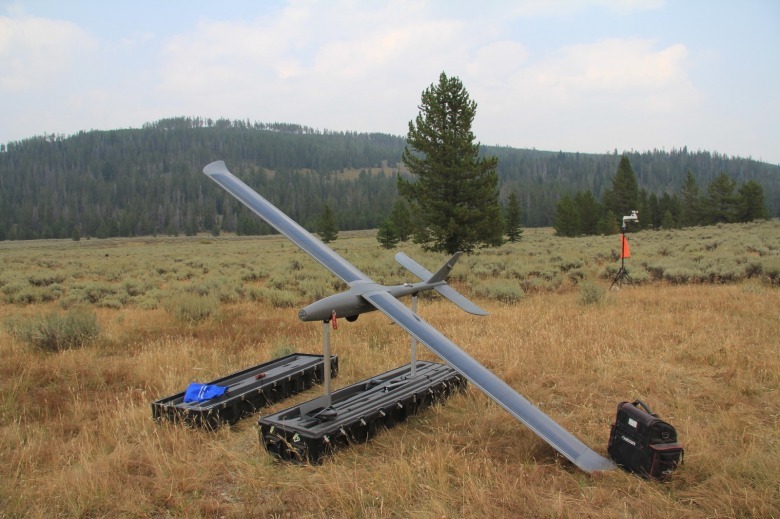 “We have serious concerns about the negative impact that flying unmanned aircraft is having in parks, so we are prohibiting their use until we can determine the most appropriate policy that will protect park resources and provide all visitors with a rich experience," former Park Service Director Jon Jarvis said in a statement after his agency ordered all civilian drones grounded. Despite the ban, the conduct of a New York photographer this month (November 2019) came under investigation by Yellowstone officials after he posted drone footage of Grand Prismatic on social media. Timothy McGurr, who removed the footage, responded angrily claiming that because he saw no signs declaring a no-fly-zone was in effect he believed he was free to launch his remote-controlled plane. State wildlife management agencies also have expressed concern about hunters using drones and legislatures have banned them in the use of stalking their target species. What’s troubling is how some drone operators are willing to flout regulations in order to get footage they know might earn them money. At a bare minimum, ViralHog could update their description of the video to explain that the drone operator’s behavior was highly unethical and could have caused great harm to the bears. For example, viral video site LADbible shared the same video, but titled it “Drone Causes Bear Cub to Fall.” Video-sharing sites should hold themselves to the same ethical codes that professional filmmakersobey. Finally, it’s worth pointing out again that ViralHog is based in Bozeman, Montana, largest hub of the Greater Yellowstone Ecosystem. Those of us lucky enough to live, work, and play here have a special set of responsibilities: we are the stewards of an iconic region, some of the wildest, most intact habitat in the industrialized world. Whether as individuals, organizations, or businesses, we should hold ourselves to a high standard when it comes to protecting wild nature, whether it’s on our doorstep or a hemisphere away. The natural world is more than a source of mere entertainment for us. MoJo gives you important reads that take a lot of time to research and they are offered to you free. In turn, we rely on your generosity to help us continue. Please support us by clicking here. 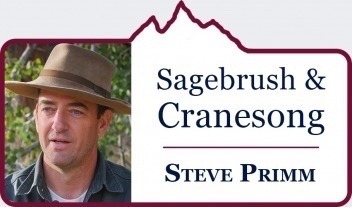 Steve Primm is Mountain Journal's associate editor. 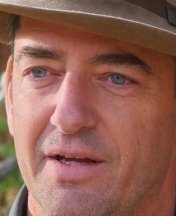 A former professional conservationist who specialized in resolving conflicts between humans and carnivores, such as grizzly bears and wolves, he is a research fellow with the Northern Rockies Conservation Cooperative, headquartered in Jackson Hole. Primm, a lifelong lover of the outdoors, remains a volunteer emergency responder living in the southern Madison Valley of Montana located on the western side of the Greater Yellowstone Ecosystem.